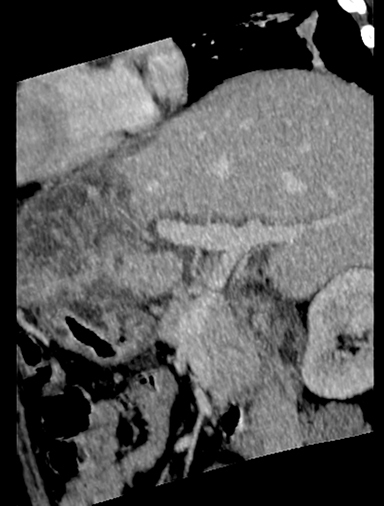 A 26-year-old woman, third gravida (G3P1L0A2), with a history of recurrent fetal loss, presented with complaints of epigastric pain, nausea and vomiting. Laboratory investigation revealed thrombocytopenia (41,000/cumm), raised SGPT (140 IU/L), SGOT (224 IU/L) and S.ALP (113 IU/L). Prothrombin time was normal. S.APLA and S.ANA were negative. Infectious screen was negative. 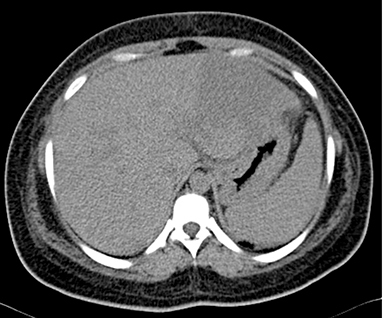 USG abdomen was suggestive of mild hepatosplenomegaly with an ill-defined inhomogenous echo pattern in the left lobe of liver, small-volume ascites and right pleural effusion (Figure 1). USG obstetric scan revealed intrauterine fetal demise. Delivery, induced with prostaglandin E2, was uneventful and the patient was discharged with stable vital signs. The patient was readmitted 3 days post-discharge with abdominal pain and fever. Blood investigations showed leucocytosis and thrombocytopenia. 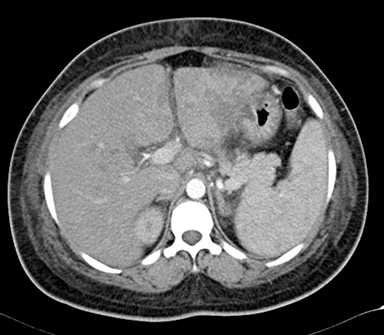 A contrast-enhanced CT scan of the abdomen and pelvis was done with provisional clinical diagnosis of hepatic abscess. The scan revealed mild to moderate ascites with mild bilateral pleural effusion with passive atelectasis of underlying lung parenchyma (Figures 2-6). 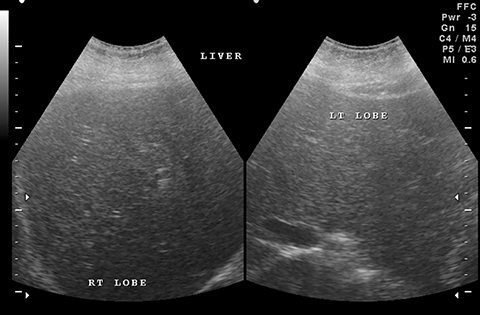 Follow-up ultrasound abdomen was performed after 6 months, showing normal hepatic parenchymal echotexture (Figure 7). The patient was advised to get her protein C, protein S and antithrombin III levels checked. 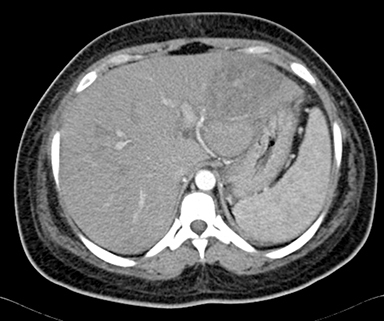 The MDCT abdominal scan revealed mild hepatomegaly with multiple round, central and irregular, wedge-shaped peripheral hypodense areas in segments II, III, IV B, V and VIII of liver. 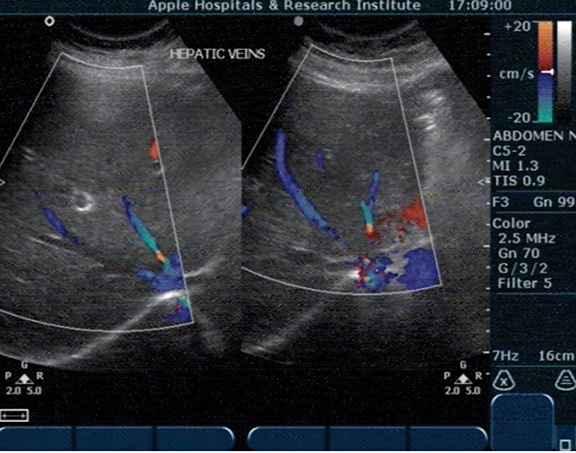 There was poor opacification of segmental branches of left portal vein in segment II and III. Mild to moderate ascites with mild bilateral pleural effusion with passive atelectasis of underlying lung parenchyma (Figures 2-6). Hepatic infarcts can occur at all stages of pregnancy from the 7th week to postpartum. Hepatic infarcts in pregnancy are mostly secondary to APS (Anti-Phospholipid Syndrome), HELLP syndrome (hemolysis, elevated liver enzymes, low platelets) and preeclampsia. Both hepatic arteries and portal veins may be involved in APS. Arterial thromboses of both large and small hepatic arteries are seen. The differential diagnoses of intra hepatic infarction include intrahepatic abscess, acute fatty liver of pregnancy, thrombotic thrombocytopenic purpura, hemolytic uremic syndrome, ruptured hepatic adenoma, hepatocellular carcinoma and hemangioma. Preservation of portal tracts helps in differentiating infarction from other causes of hypo-attenuating lesions in the liver. Laboratory findings include anemia, thrombocytopenia, leucocytosis, marked aminotransferase elevation and azotemia. Changes are typically found in right lobe. Treatment includes urgent delivery. Patients with infarct can be managed conservatively and transfused. They are at risk of intrahepatic infection. Torabi M, Hosseinzadeah K, Federle M. MDCT of nonneoplastic hepatic vascular and perfusion disorders. Radiographics. 2008;28:1967-1982. Giovine S1, Pinto A, Crispano S, Lassandro F, Romano L. Retrospective study of 23 cases of hepatic infarction: CT findings and pathological correlation. Radiol Med. 2006;111(1):11-21. Cook GJ, Crofton ME. Hepatic artery thrombosis and infarction: Evolution of the ultrasound appearances in liver transplant recipients. Br J Radiol. 1997 Mar;70:248-251. Joshi D, James A, et al. Liver disease in pregnancy. Lancet. 2010;375: 594-605. 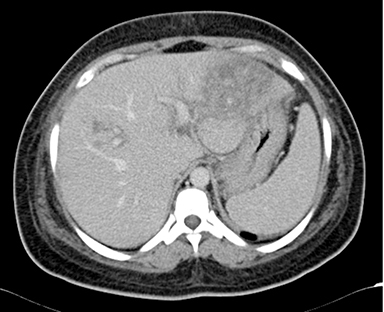 Radiological Case: Hepatic infarction. Appl Radiol. Prepared by Dr. Thakkar and Dr. Bhaya while at Apple Hospitals and Research Institute, Kolhapur, India. The authors wish to express their sincere thanks to Sayi Prasad, MD, DNB(Med), consultant physician and Kiran Patankar, MD, DMRD, consultant radiologist, for their positive contributions towards management of the patient described in this case report.